Shaping up the final race for the 2010 NASCAR Sprint Cup Series, the Ford 400 plays host to what has been a season where we have seen some pleasant surprises. The major success is the tight Chase for the Sprint Cup which has placed Denny Hamlin, Jimmie Johnson and Kevin Harvick within 46 points. By the end of 400 miles at the Florida 1.5 mile oval, the 2010 NASCAR Sprint Cup champion would be celebrated by one driver. For all competitor making the 43 car field for the Ford 400, there were personal as well as team honours at stake. Concluding at the Homestead-Miami Speedway, the achievements of 35 earlier races have yet some drivers hungry for more success or thirty to revive a season sporting misfortune. Involved in a fair amount of bad experiences in 2010, Kasey Kahne's future has been the biggest story than his current season. In reaction to Kahne's 2011 and 2012 plans, 2010 was impacted when he departed his #9 Ford early for the Red Bull #83 Toyota. For the Ford 400, Kasey Kahne was able to place his Toyota on pole for what will be the last NASCAR Sprint Cup pole for almost three months. Kasey Kahne led the first 4 laps of the Ford 400 until the Phoenix race winner Carl Edwards driving his Roush-Fenway Racing-owned #99 Ford muscled past the #83 Toyota for the lap 5 lead. Losing the lap just briefly during a lap 20 pit stop under the race's first caution for Devid Reutimann's wall impact on turn 4, Edwards would retake the lead in time for the restart back to green flag conditions. As the field began to race again on lap 23, a second caution came swiftly. A critical incident for the 2010 Chase for the Sprint cup the #16 Ford of Greg Biffle made contact with title leader Denny Hamlin. Hamlin's #11 Toyota was forced into the in-field grass in order to regain control. Both cars were able to continue in contention but the Joe Gibbs Racing crew spent several pit stops to repair the mingled front end of the #11 machine. Showing part of Ford's late season resurgence in NASCAR Sprint Cup racing for 2010, a challenger did present himself in the Ford 400. The #56 NAPA Auto Parts Toyota piloted by Martin Truex Jr posted a significant appearance in the final race of 2010. Taking the lead on the first time on lap 73, Truex Jr initial time ahead of the field lasted for 26 circuit. As the #99 Ford of Edwards emerged as a dominant car early, Martin Truex Jr's #56 Toyota provided the fiercest fight through the first half of the Ford 400 at Homestead-Miami. On lap 88, Jeff Gordon's #24 Chevrolet began slowing as the four-time Cup champion reported an engine misfire. Down on power, the #24 car of Gordon fell to 24th place just 3 laps later. Hendrick Motorsports crew were optimistic the problem was limited to a disconnected spark plug. Unfortunately for the #24 crew, a pit stop during the third caution would leave the team in a more somber mood as the engine's lack of power appears to be a more terminal issue. The problems of Denny Hamlin early left the Chase for the Sprint Cup interesting through this finale By lap 120, Kevin Harvick was leading the Cup contenders on track in 5th place. Jimmie Johnson was close behind in 8th while Denny Hamlin was recovering nicely from the lap 25 incident. The #11 Toyota crept up to 20th on the race track. Caution flew just past of the mid-way point of the Ford 400 as the #47 Toyota of Marcus Ambrose impacted the wall on turn 4. After pit stops, the Michael Waltrip Racing #56 Toyota preserved the lead but Carl Edward sailed back to the lead as the drivers continued a see-saw battle. Juan Pablo Montoya and Joey Logano were parties involved with a three-wide scenario which quickly results in the #42 of Montoya touching the #20 Toyota. The contact triggered the #20 of Logano into the wall to suffer massive front end damage. Joey Logano's race season ended with a crushed Toyota and an emotionally-crushed Joe Gibbs Racing Home Depot crew leaving competition before the checkered flag. Juan Pablo Montoya and Bill Elliott also sustained damage but continued to race the duration of the Ford 400 event. With 100 laps to go, only 7 points separated the top-3 drivers in the Sprint Cup championship fight as the Ford 400 was led make to green by Carl Edwards. Denny Hamlin, one position behind Jimmie Johnson on the Homestead-Miami race track following pit stops, achieved a marvelous restart passing Johnson quickly as the Joe Gibbs Racing driver charged his way forward. Five laps later, the #11 Toyota of Hamlin has launched himself into the top-ten runners. Kevin Harvick made a dramatic surge to lead the field back on to the Homestead-Miami race track. Regrettably, Harvick and the Richard Childress Racing crew had a short-lived triumph as NASCAR deemed speeding on pit road. An 8th caution with 73 laps to go slowed the field as the #38 Ford of Dave Blaney hit hard between turn 3 and 4 striking the retaining wall. At the restart, the #56 Toyota slowed developing a flat tire. The driver held on to the #56 Michael Waltrip Racing but the deflated tire ruined the day for Martin Truex Jr. Little more than a lap following Martin Truex Jr's tribulations, caution came out for oil on the race track. Jeff Gordon's #24 Chevrolet wounded run ended as the Hendrick Motorsports engine gave up. Denny Hamlin and Kevin Harvick pitted on lap 239 for fuel as well as tires under green bracing for the final run to the finish ahead of Jimmie Johnson. After the leaders pitted, caution came out just a few laps later spoiling their title charge effort. The race's 10th yellow flag on lap 243 flew for a scary incident involving the #18 Toyota of Kyle Busch. Racing with Kevin Harvick for track position, the #29 Chevrolet connected with the #18 of Busch. Smashing the wall hard with his Camry's front end, Busch found smoke and flames building up in and around his #18 Joe Gibbs Racing Toyota. Kyle Busch was thankfully unhurt but was left disappointed he was unable to sweep the final race weekend. 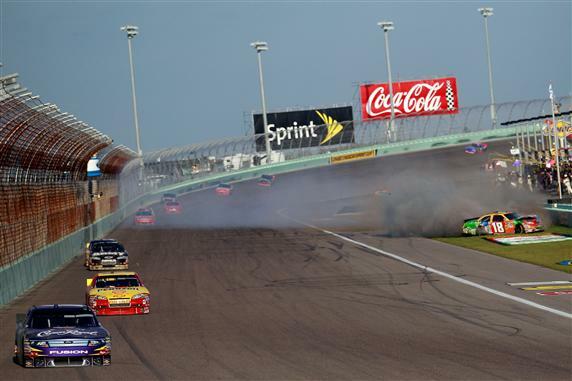 Busch had won the Camping World Truck Series and the Nationwide Series finales for the Ford Championship Weekend at Homestead-Miami Speedway. From the resumption of the race after the final caution, Carl Edwards held onto the led while Jimmie Johnson took a firm grip of an important 2nd place position. With Kevin Harvick following Johnson in 3rd and Denny Hamlin buried deep outside of the top-10 through the final laps, the #48 Lowes Chevrolet was in the ideal spot to take an unprecedented 5th straight Sprint Cup title. 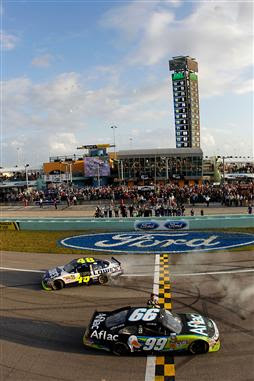 Crossing the finish line, Carl Edwards' #99 Ford maintained an 1.609 second lead over Johnson's #48 Chevrolet. After winning in Phoenix, Edwards capped a nearly two-year long winless streak which dated back to victory at Homestead-Miami Speedway in 2008. Carl Edwards waited only one week to gain a second victory to round out the 2010 season. Another outstanding performance for Ford, Edwards led 190 of the races 267 laps. 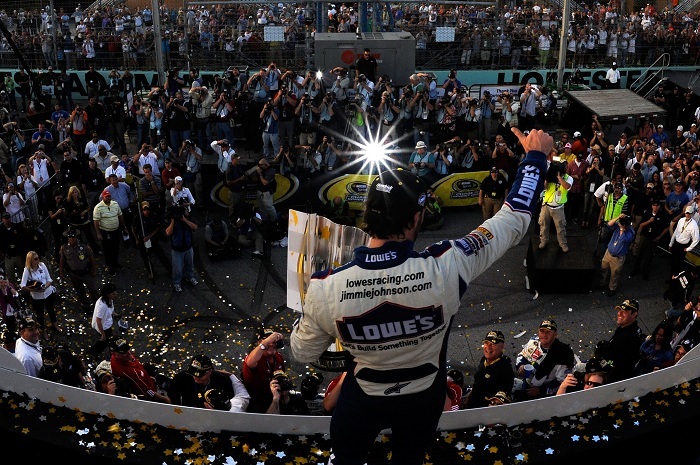 As Jimmie Johnson finished second, he became the 2010 NASCAR Sprint Cup Champion. Coming into the NASCAR Sprint cup finale, Johnson was unaccustomed to being on the outside of the championship lead from his experiences for the first four titles. Coming up short on the year, Kevin Harvick finished 3rd in the Ford 400 and 3nd overall (41 points off of Johnson) in the Sprint Cup Chase standings. Due to NASCAR Sprint Cup's Chase format, Harvick gave up a healthy points margin in exchange for this points payoff. Having entered the season with few questions on Kevin Harvick's driving ability, questions surrounded whether his time was best spent at Richard Childress Racing. With 3 wins and 26 top-10 finishes (the most of any driver in 2010), the Californian driver returns in 2011 as a bona fide Sprint Cup contender. NASCAR Sprint Cup points runner-up in 2010 Denny Hamlin season ended with a 14th place run at Homestead, the Joe Gibbs Racing driver's Chase points totaled to a 39 marker deficit to Jimmie Johnson. With Ford prevailing in the race bearing their corporate name, Richard Petty Motorsports (RPM) cars round out the top-5 behind Harvick. A career-high finish for Aric Almirola of 4th place was accomplished by the young, part-time driver of the #9 Ford while RPM's potentially brightest star for 2011 AJ Allmendinger brought the #43 Ford home 5th. With all 36 races in the books for 2010, the NASCAR Sprint Cup Series will next celebrate the season that was leading up to the NASCAR Sprint Cup Banquet. For another year, Jimmie Johnson will be the guest of honour. Congratulations!